What’s Included in the Video Analytics Report? 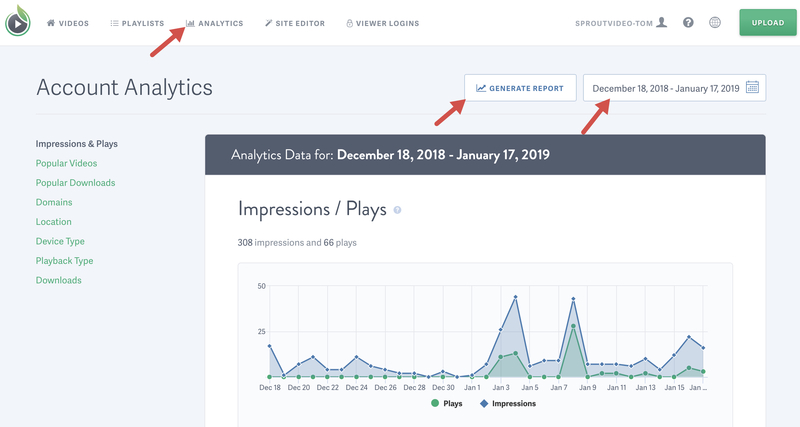 The exportable video analytics report is a CSV file which includes all analytic data collected for your videos during the specified time frame. This makes it really easy to see all the high level data associated with all the videos in your account. This data will be compiled for all videos in your account for your selected time frame in the exported CSV file. First, navigate to the ‘Analytics’ page. Here, you will see the date picker and the ‘Generate Report’ button. Use the date picker to select the time frame for the data you wish to export. Once your time frame is selected, click the ‘Generate Report’ button. Once the report is compiled, you’ll receive an email containing a link to download your report. Once the link is clicked, a browser window will open and download the CSV file contained in a ZIP folder.